“From the outside, visitors might be hard-pressed to imagine some of Santa Barbara County’s best wines are kept in Carr Vineyards’ Santa Ynez tasting room for aging. Inside, it’s a different story. 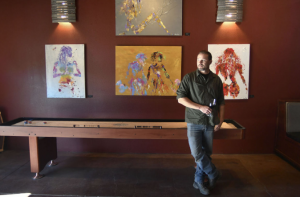 The tasting room and warehouse on Numancia Street is rustic and artsy — a place where wine is celebrated, rather than merely sampled. Spacious and inviting, the Santa Ynez tasting room features a long, upright shuffle board next to a large seating area. The walls are adorned with modern art. The U-shaped wine-tasting bar is built for hospitality, with plenty of stools for lots of guests. In the rear, cases of wine are stacked for aging. Between the seating area and the wine bar, there is lots of room for guests to mingle. In addition to attracting young clientele, many of today’s upstart wineries are leveraging website traffic to drive sales, with most “wine clubs” accessible online. After speaking with Carr, it’s apparent the vineyard has survived the better part of two decades because he and his wife, Jessica, understand the business of wine making in Santa Barbara County. He knows the region’s zoning limitations and its attraction to wine lovers. Founded in 2000, Carr Vineyards stands apart from many competitors because it grows its own grapes without owning the land. This distinguishes Carr from wineries that ‘source’ their grapes from independent growers. ‘As a grower, you can play with so many different varietals, and so many different microclimates, and so many different soil types,’ Carr explained. The decision to grow grapes on leased properties fits with Carr’s primary objectives: make good wine and stay in business. 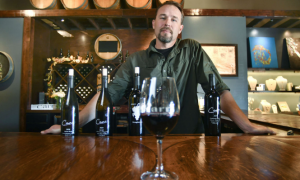 Carr, who worked at Central Coast Wine Services in Santa Maria after attending college in Arizona — and then as an assistant winemaker for Kahn Winey— said he learned about the business side of wine making watching others. ‘As easy as it is to get people to invest in your winery, it’s not necessarily the best idea — for both the investors and winery,’ Carr said. He credits Jessica, the company’s general manager, with marketing, selling and distributing Carr wines. ‘My wife has been instrumental in getting our wines in the right restaurants and in front of the right [distributors]. ‘The amount of time it takes to recoup your money in this business is exponential,’ he continued, emphasizing it takes many years to turn a profit without compromising standards. Carr was given an opportunity to work for a local winery shortly after moving to Santa Ynez. He quickly discovered his forte was working in the vineyards, among the soil. At Kahn Winery, he became aware of how well-suited the Central Coast is to growing wine grapes. He cited Lompoc and Santa Maria as superb Burgundy growing areas, while Santa Ynez grows excellent Rhone varietals. Because of his experience working in the fields and getting his hands dirty, Carr decided he wanted to be a grower, in addition to making his own wines. ‘I really enjoy growing the grapes myself and having direct contact with the vines in the soil,’ he said. Rather than partnering with wealthy investors to purchase land, he made the decision to approach existing property owners about leasing and growing grapes as Carr Vineyard Management Co. 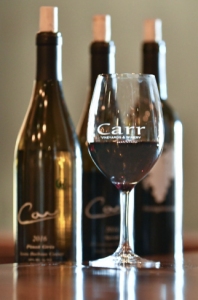 In 2000, Carr Winery was started with the goal of working with property owners throughout the region to offer different varietals, including the winery’s award-winning cabernet franc, pinot noir and pinot gris. The majority of the winery’s current vineyards are in Santa Ynez Valley, including Santa Rita Hills, Los Olivos and the east end of Happy Canyon. He refers to them as AVAs: American Viticultural Areas that are certified based on climate and soil studies. Managing all those leased properties is time consuming, but the alternative — seeking deep-pocket investors and buying premium wine-growing land — doesn’t thrill Carr. 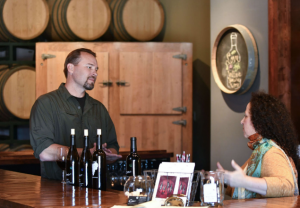 The winemaker was anxious to discuss Carr’s new tasting room on Alisal Road in Solvang, where the company’s Crosshatch brand is served. Carr places great importance on not uncorking a bottle of wine before it’s ready. The businessman in Carr emerges while discussing proper aging. For Nicole Liddi, tasting room manager at Carr’s Santa Ynez facility, it’s that commitment to quality she admires about the winemaker. Liddi, who earned her bachelor’s degree in enology and viticulture from Hancock College, said Carr is environmentally concerned about issues — such as soil erosion and waste water drainage. 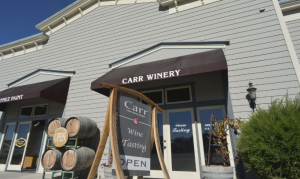 Carr attributes much of the winery’s success to the dedication of his employees and his wife’s marketing and distribution efforts. ‘Between our two tasting rooms, the people we have working for us are key to building a good-size wine club and following,’ Carr said, reiterating he entered the wine business for the long haul. ‘You have to have a 15- to 20-year vision if you’re going to get into wine making.